Martin Van Buren (1782 – 1862) was an American politician who served as the 8th President of the United States from 1837 to 1841. Before becoming president, Van Buren held a number of important posts. Among other things, he served as the 10th Secretary of State and the 8th Vice President during the presidency of Andrew Jackson. The foreign affairs during the presidency of Van Buren were dominated by issues between United States and Great Britain. He successfully resolved tensions between the two nations which contributed to healthy relations in the 20th century between the U.S. and the U.K. The domestic policy of Van Buren revolved around handling the recession brought about by a financial crisis known as the Panic of 1837. He has been generally criticized for his measures to resolve the recession but modern economists view his deregulatory economic policy more favorably. Here are the 10 major accomplishments of U.S. President Martin Van Buren. 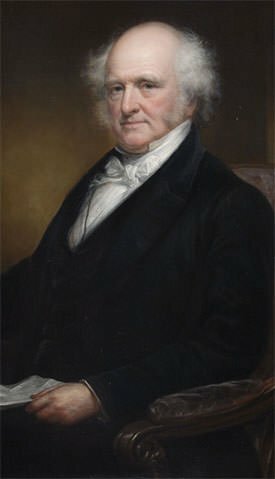 Martin Van Buren was an apprentice to prominent lawyer William Peter Van Ness and he completed his legal studies in 1802. In 1803, Van Buren became an attorney in Columbia County, New York. He was a successful lawyer. In 1808, he was appointed as Surrogate of Columbia County, New York. He legal practice continued to flourish and he served in this position till 1813. In 1815, he was elected to the position of the Attorney General of New York. He served in this capacity from February 17, 1815 to July 8, 1819. 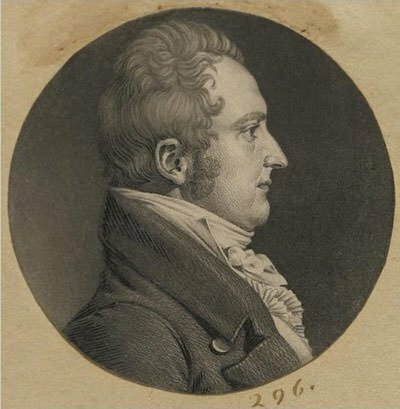 Van Buren became involved in politics by the age of 18 when he helped John Peter Van Ness, brother of William Van Ness, win the party nomination for the election to New York’s 6th congressional district. Van Buren’s first major breakthrough came in 1812 when he won the election to the New York State Senate. Martin Van Buren served as a Member of the New York State Senate from 1813 to 1820. Among other things, he was a strong supporter of the War of 1812 against Great Britain and his strong stance helped bolster his reputation as a politician. Van Buren entered into national politics in 1821 when the state legislature elected him to represent New York in the United States Senate. He served as US Senator from New York from March 4, 1821 to December 20, 1828. Van Buren established friendships with prominent politicians and frequently engaged in debate on the Senate floor. He thus quickly became an influential political figure in Washington, D.C. As Senator, among other things, Van Buren strongly supported and helped Andrew Jackson win the United States presidential election of 1828. Through his use of patronage; loyal newspapers; and connections with local party officials and leaders; Martin Van Buren established what became known as the Albany Regency. The Albany Regency was a state political organization which went on to control the New York state government between 1822 and 1838. 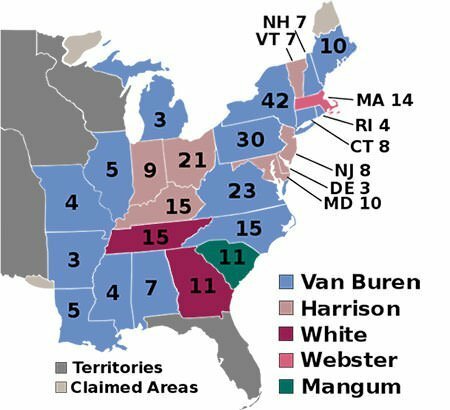 In 1828, Van Buren ran for the post of Governor of New York and won the election. He served in this post for only 12 weeks from January 1, 1829 to March 12, 1829. During his short term, he championed the Safety Fund Act, which provided an early form of deposit insurance. After Andrew Jackson became American president in 1829, Van Buren resigned as Governor of New York to become the 10th United States Secretary of State under Jackson. Van Buren achieved several notable successes as Secretary of State. Among other things, he settled long standing claims with the French to win reparations for property that had been seized during the Napoleonic Wars; he reached an agreement with the British to open trade with the West Indian colonies of Great Britain; and he concluded a treaty with the Ottoman Empire that gave American merchants access to the Black Sea. In addition to these duties, Van Buren also acted as an important adviser to President Jackson on major domestic issues like tariff and internal improvements. 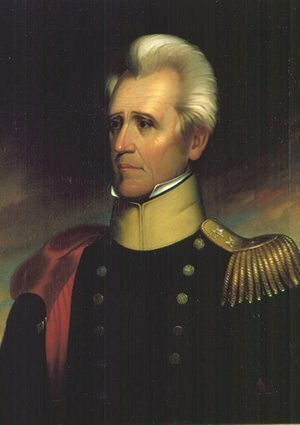 In the United States presidential election of 1832, Andrew Jackson was re-elected. Van Buren was his running mate and he thus became the 8th Vice President of the United States, serving from March 4, 1833 to March 4, 1837. With the support of Jackson, Van Buren won the Democratic nomination for the next election. In the United States presidential election of 1836, Martin Van Buren defeated four candidates fielded by the Whig Party. He won the election with 764,198 popular votes, 50.9 percent of the total, and 170 electoral votes. Martin Van Buren served as the 8th President of the United States from March 4, 1837 to March 4, 1841. In the 1840 presidential election, he was defeated by Whig nominee William Henry Harrison. 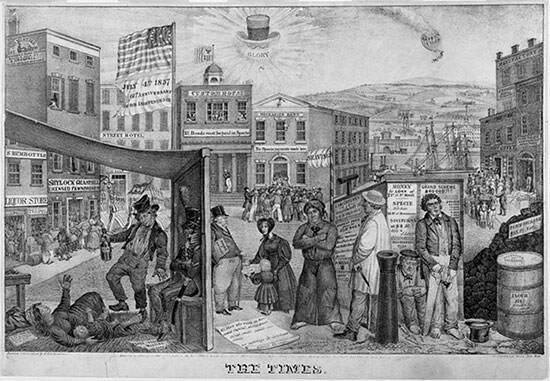 The major issue during the presidency of Van Buren was a financial crisis known as the Panic of 1837, which set off a major recession that lasted until the mid-1840s. President Andrew Jackson had destroyed the Second Bank of the United States leading to the existence of only state-chartered banks. Van Buren’s opponents proposed rechartering the national bank. However, Van Buren refused to do so and instead established the Independent Treasury to manage the money supply of the nation. 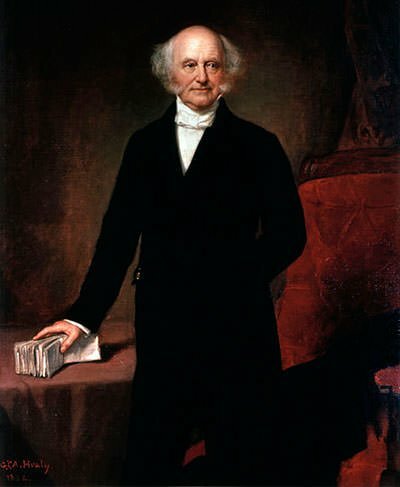 Van Buren was widely blamed for the recession and it was one of the primary reasons behind his losing the next election. Van Buren’s refusal to use government intervention has been criticized by most historians and considered a major failure. However, modern economists generally view his deregulatory economic policy as successful in the long term for its importance in revitalizing banks after the panic. In 1837 and 1838, there were rebellions in Lower Canada and Upper Canada against the British rule. In sympathy to these rebellions, a secret association was founded in the United States known as the “Hunter’s Lodge”. Members of the Hunter’s Lodge attacked the British colony of Upper Canada more than a dozen times between December 1837 and December 1838. These raids are collectively known as the Patriot War. The Van Buren administration followed the enforcement of the Neutrality Act, encouraged the prosecution of these unauthorized militia and actively deterred U.S. citizens from causing disruptions abroad. Although there was backlash among the citizens against this decision initially; in the long run, Van Buren’s opposition to the Patriot War contributed to healthy relations in the 20th century between the U.S. and Great Britain; and U.S. and Canada. In late 1838, a crisis erupted in the disputed territory on the border of Maine in U.S. and New Brunswick in British Canada. The crisis arose as Americans were settling on the long–disputed land claimed by both the nations. Tensions then escalated into a near war as both Maine and New Brunswick started arresting each others citizens. The situation worsened as British troops started gathering on one side and John Fairfield, the governor of Maine, began mobilizing the state militia to confront the British in the disputed territory. To settle the crisis, President Van Buren met with the British minister to the United States. The two agreed to resolve the border issue diplomatically. Van Buren was then able to convince all sides to submit the issue to arbitration and the border dispute was resolved a few years later in 1842, through the Webster–Ashburton Treaty.